Compared to the other Prepper Life Skills I’ve gone over (wheel alignment: guaranteed to drive you batty, and finding north), changing your vehicle’s oil is an easy job, usually. There’s absolutely nothing wrong with having a mechanic do this for you, but in the event of a long-term disaster, knowing how to change your oil will extend the life of your vehicle. It’s a gentle way to get into maintaining and learning about your vehicle. I’m a big believer that when you do things it changes you. You start to see yourself as more capable. You’re more willing to take on other projects. This is why I think it’s good for preppers to tackle small do-it-yourself projects. Let’s get started. First, you’ll need to buy some things if you’ve never done this before. You’ll need to get the right type of oil for your vehicle, say 5W-30 or 10W-30 oil. I like to stick with one brand, like Pennzoil, because different makers add different additives that might not play nicely together inside your engine. Many vehicles will require about 5 quarts of oil. Be sure you have a bit extra on hand. Whenever you change the oil, you’ll want to change the oil filter. You’ll need to go to a website like oreillyauto.com to find out what type of filter you need. I like Purolator brand filters. When you drain the old oil, you’ll need a large pan to collect the oil. You can get these at any automotive store or Walmart. You’ll need to bring your old oil to a service station or to community hazardous waste center to eventually get rid of it. Because some oil will spill, have a few clean rags handy. You’ll want to purchase a strap wrench (just a few bucks) to remove the old oil filter. You can compare your new filter to the strap wrench size to be sure it will work. Purchase a few funnels, which are used to add oil and other liquids to tiny openings. A box of disposable Permatex Nitrile gloves will make the job cleaner. You’ll need a socket set or wrench to remove the drain plug to drain the oil. I’d suggest purchasing a good six-point socket set and get a breaker bar too. That will give you more leverage if you need it. If you need more leverage to remove a stubborn bolt, a small section of pipe over a wrench makes a great cheater bar. Most importantly, you’ll probably need to get your vehicle raised a bit into the air so you can reach the drain plug and filter under the vehicle. For this, I’d recommend 12,000 pound Rhino Ramps, which actually support about half that for a pair or about 3,000 pounds per ramp. Step 1. Get the car just slightly warm. Warm oil drains best. Don’t have it hot. Just driving your car up the ramps should help warm it. Line up the wheels with the ramps. If you have some sand bags, but those behind the ramps to keep the ramps from slipping. Drive the car right up to the ramps with the wheels pointed straight ahead, put the car in park, and check the alignment. The ramps should be equally spaced and the wheels should go up the center of the ramps. Don’t be too far off to one side of a ramp. Some people will drive up ramps by feel alone, but I like to place a good-sized mirror a few feet away from the driver’s side door on the ground where it allows me to see the tires going up the ramp. This lets me know when to put the brakes on. If you hit the end of the ramp, a lip on the ramp will stop your forward progress, but being a sufficiently paranoid, I like to have plenty of room in front of the ramps just in case they’d slide or somehow the vehicle would overshoot. As you drive up the ramp’s incline, you’ll need to gently give the vehicle gas throughout the journey. If you take your foot off the accelerator, the car will tend to roll back down the ramps. Once the car does this, just let it roll back down and try again. If you took your foot off the accelerator and tried to compensate by flooring the pedal, you could overshoot the ramps, drive through a garage wall, or do something else horrible. Slow and controlled up the ramps is the motto. Step 2. With the vehicle on ramps and in park, open the hood and remove the oil filler cap. Also place something to block the rear wheels. You can purchase wheel chokes. Get underneath the vehicle with your wrench and oil pan. Loosen the drain plug. Drain out the old oil. When the oil flow has become a slow drip, retighten the drain plug. You don’t need to tighten them too much. Don’t strip the threads in your oil pan. Step 3. Find your oil filter and unscrew it. You’ll probably need your strap wrench. Clean the surface where the filter mates with a rag. Pour some oil into the new filter and run some oil over the rubber seal of the filter. This helps it seal better. Tighten the filter by hand. If you’re not strong, you might want to tighten just a tad with the strap wrench, but only very little. Don’t over tighten the filter, once it’s snug it should be fine. I like to wipe the oil pan area and the filter with a rag to remove any old oil, which could be mistaken for a new leak. Step 4. Put your funnel in the oil filler hole and pour away. Don’t overfill. To find the oil capacity for your vehicle, you can look at the owner’s manual. 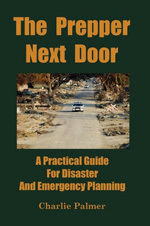 As I emphasize in The Prepper Next Door, you should also purchase the official service manuals for your vehicles. Step 5. Drive down the ramps and check the oil level on the dipstick. Add, if needed. Look at the filter and at the pan. There shouldn’t be any leaks. Congratulations! You’ve just changed your oil. Now that you’ve changed your oil, you can lean about other aspects of vehicle maintenance. If your vehicle breaks down during an evacuation, it’s nice to have some skills to deal with the most common problems. Know how to change a radiator hose, replace a blown tire, jump start a car with a dead battery, etc.